”Wow!’, ”Cool!’, “Fantastic!”, “A revelation!” – this was the first reaction of our colleagues when we presented fresh dbForge Studio for MySQL, v7.4 to them. Indeed, our team has done a huge work in to meet our customers’ needs and expectations. In a bid to fulfill this objective, we have enhanced our renowned MySQL GUI tool with the most timely and essential features, improvements and updates. 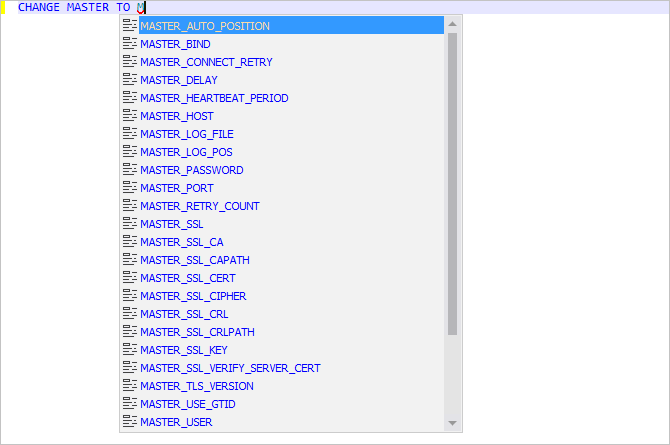 And now, we are eager to unveil all these awesome additions to dbForge Studio for MySQL to you. The list turned out to be quite impressive and long, but believe us, it is worth at least looking through. To put the story short, let’s start! We are super excited to present a crown-jewel feature of this release, – Support for Google Sheets when exporting and importing data. Now, you can easily migrate table data between your MySQL tables and Google Spreadsheets. All you need to do is to specify the URL/ID of your Google Spreadsheets table, and our handy Data Export Wizard and Data Import Wizard will do the rest of work for you! 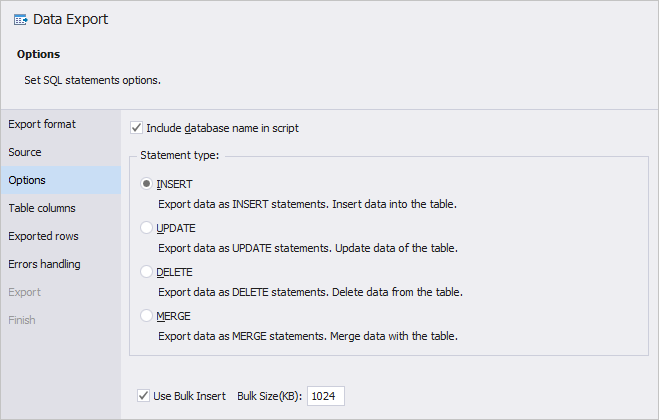 When exporting data to SQL as the INSERT statement, you can select the USE Bulk Insert option and set the bulk size. The option hugely boosts data export and saves your time! 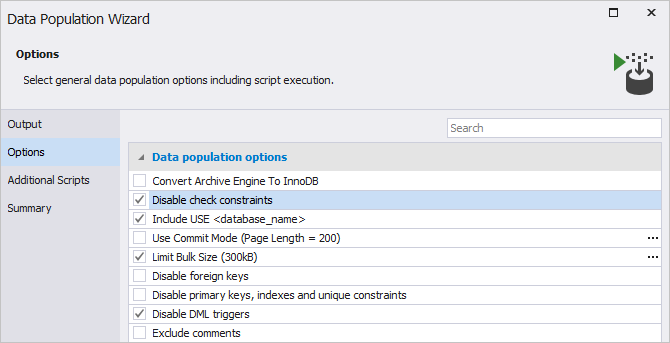 When query execution is completed, a notification with such details as the name of a document and duration is displayed. In addition, you can enable a notification and specify execution duration on the Notifications tab of the Options menu. The notification alerts users that a transaction has not been completed if you execute a script. It contains the document name and a number of open transactions. On the Options menu, notifications for transaction reminder are selected by default. Additionally, you can set duration on the menu. Now, the currently selected line of code is highlighted with a color effect. Also, BEGIN … END construct within IF can be expanded and collapsed. 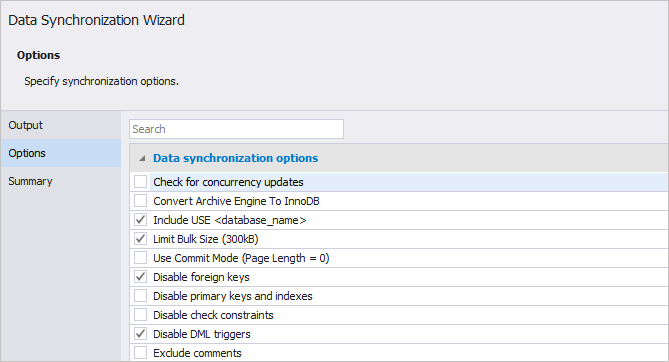 Both, schema/data comparison and schema/data synchronization feature a new progress window with the list of processes taking place and specification of time elapsed. Comparison of databases with different structures. A bunch of new comparison and synchronization options. 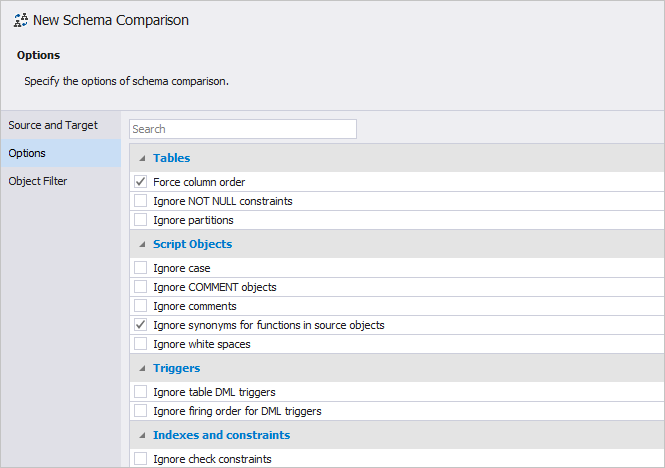 The Text Comparer section of the Schema Comparison document features a new Format Database Object Script button that allows formatting DDLs of the selected source and target objects. 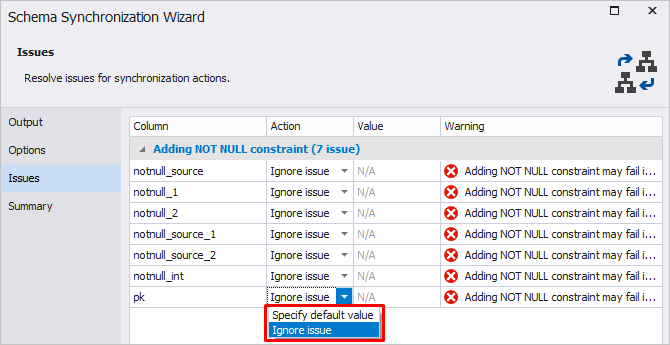 The Issues page appears only if there are any problems that may affect schema synchronization. The page allows you to easily review and resolve issues. With the Summary page, you can look through the complete plan of actions that will take place during synchronization. Also, the page includes the Warnings tab allowing to view warnings on the issues that may affect synchronization. 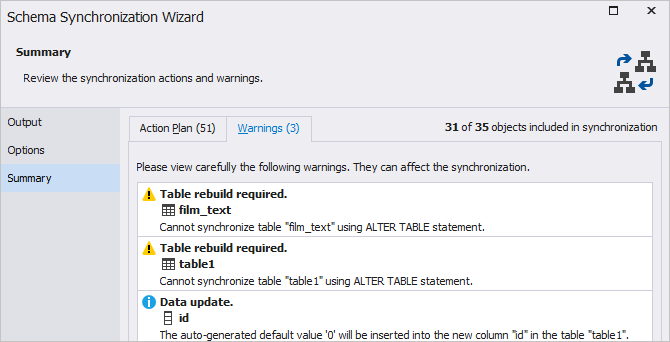 The Column Mapping dialog box features two new columns, – Compare and Sync that allows including and excluding columns from comparison and synchronization. 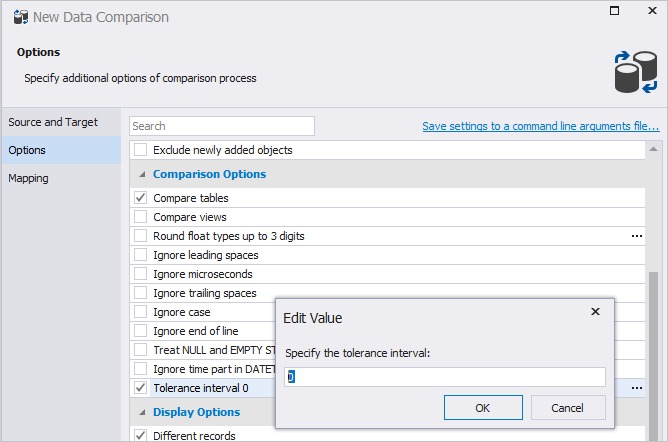 The Options tab of the New Data Comparison wizard includes the Tolerance interval option. The option allows specifying the module of difference between the values of source and target. If it does not exceed the specified value, the values are considered equivalent. The notification alerts users about the result of database copying. It also contains the number of copied databases and the time spent on copying. Now, dbForge Studio for MySQL allows copying databases through the command-line interface. 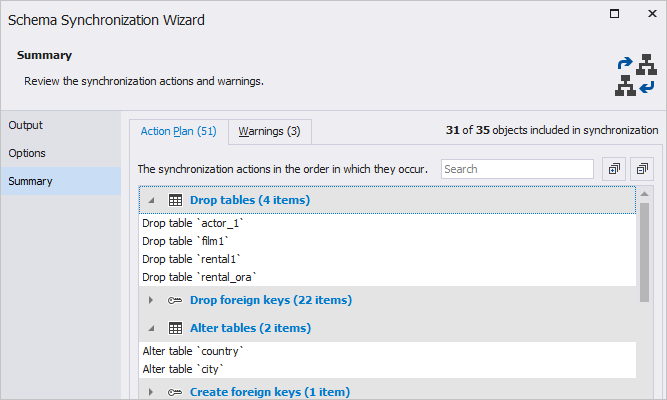 The aggregate functions available in the Selection tab of Query Builder have been reorganized to provide the most-used functions first. Also, the design of the WHERE clause has been improved. 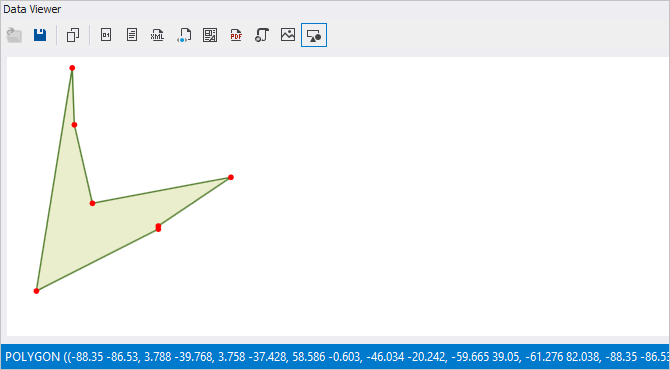 Spatial Viewer features the object type and its coordinates. ENUM, GEOMETRY, and UNSIGNED NUMERIC data types have been supported in the Data Editor column headers. Digital signature for the installation file. Support for SHA256 Authentication when connecting to MySQL.